I wrote earlier (Denis Thorpe and Hebden Bridge) about how a photograph from a while ago continues to influence me today. In this article I want to consider how another photograph both frightened and excited me when I first saw it, and drove me to pursue both those feelings in similar environments. 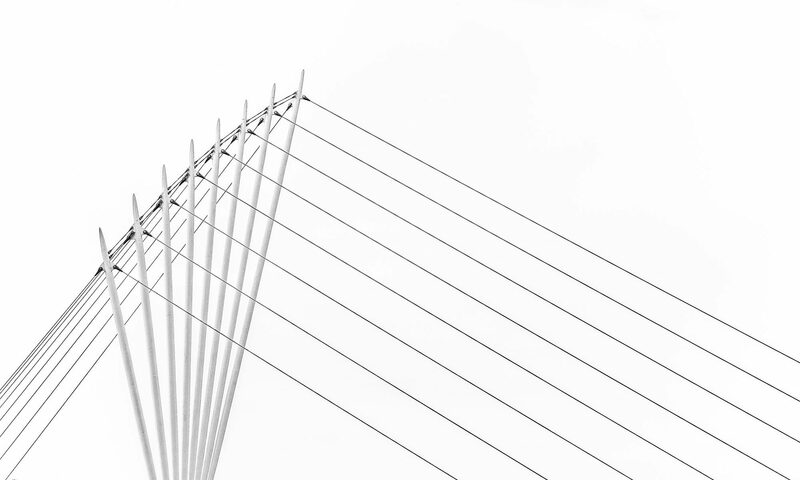 Can photographs really have that sort of an impact? 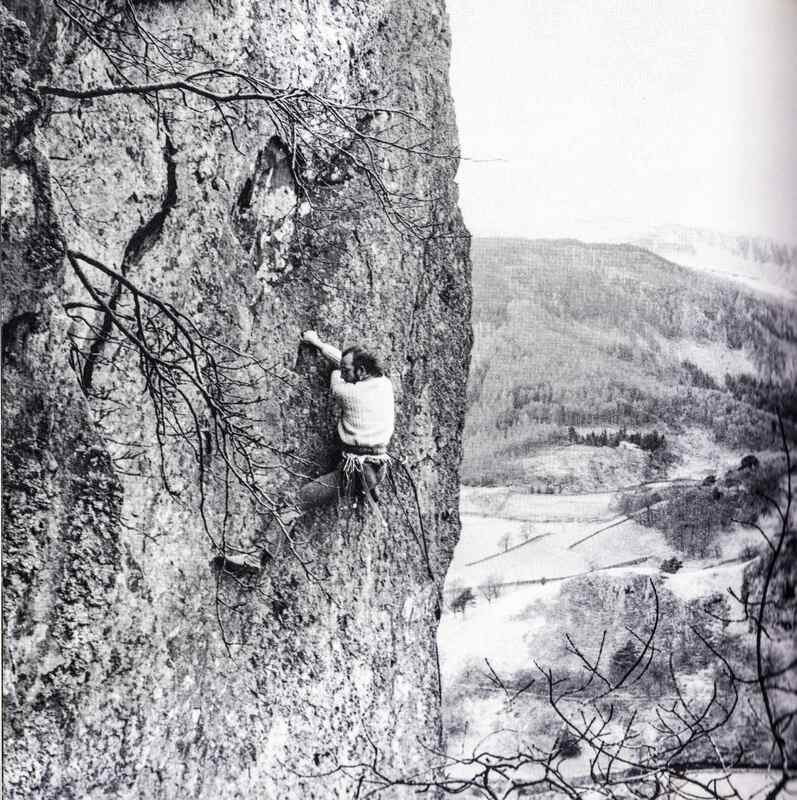 The picture is Ian Roper’s picture of Ed Grindley climbing a route, North Crag Eliminate, on the Castle Rock of Triermain in the Lake District. 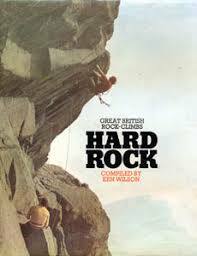 It appeared in a collection of climbing essays edited by the late Ken Wilson called Hard Rock. This book appeared in our local library in 1974 as soon as it was published and I had it out on loan almost permanently for the next 2 years. Hard Rock compiled by Ken Wilson. The climb on the cover (The Sloth at the Roaches in Staffordshire) is easier than the route discussed in this article! 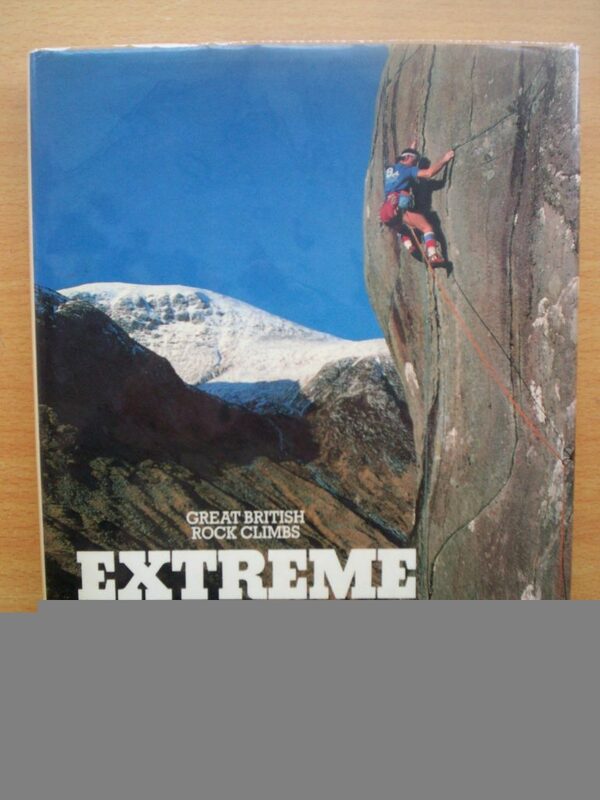 I was 15 at the time it was published and had been walking and scrambling in the Lakes for some years by then. But climbing was different and limited to sessions on basic climbing walls with school groups. Hard Rock was a catalyst then. 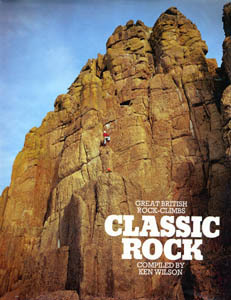 The book described ascents of some of the most influential rock climbs in the British Isles. They were none of them easy for the standards of the time; you wouldn’t have entertained any of them as a beginner. Poring over the pictures I couldn’t begin to understand how anyone could stay in position on them let alone relax enough to move around. Roper’s picture of Ed Grindley was the epitome of incomprehensibility. There was a climber trailing two ropes which disappeared around a corner behind and below him. He appears to be holding onto something on a apparently holdless wall. His arms are crossed over so instead of shuffling his hands along a ledge, it’s clear that he has felt the need to keep hold of one good hold and reach through for another. The caption tells us he is “hastening” to a point where he can rest his arms – but just where is the resting place? Meanwhile, one foot is hidden beneath his body while the other is stretched out at full reach for something indistinct, some nubbin perhaps – why? will it take his weight? All the time the exposure is grabbing at his heels, sapping his strength. How much longer is he going to be able to hang on there? What happens if he has to let go? The background is a long way down after all. And all this is happening on a day with a strong wind blowing judging from the way his hair is being pushed around. That can’t be easy. Then looking above the climber, once he has got established, somehow, where he is just now, where is he going next? The verticality just keeps going; surely he can’t just go straight up there? How? Then you start thinking: could I do that one day? All climbs are graded for difficulty and Hard Rock told me it was at the bottom of the hardest grade for the time. So, possible? But what about all that exposure, my arms aren’t all that strong. The exposure – that for me was what the photo was all about. I remember being forcibly struck by the lack of … stuff … below the climber’s feet. I can’t overstate the feelings of dread that the picture generated every time I looked at it, more so than any of the other photos in the book. All that from a picture; the written description of an ascent hardly impinged despite a hair raising account of the section in our photograph. One of the strengths of Hard Rock was the irresistible combination of good writing with some tremendous photography. 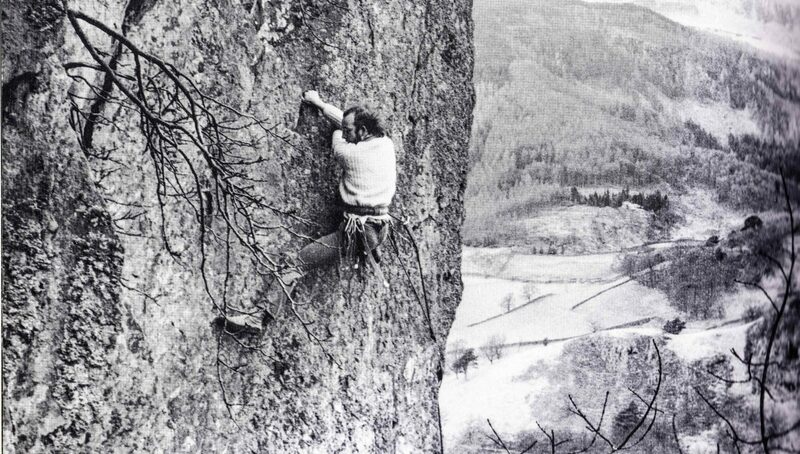 In the 70’s it wasn’t easy getting your hands on pictures of climbs that only the best climbers did. 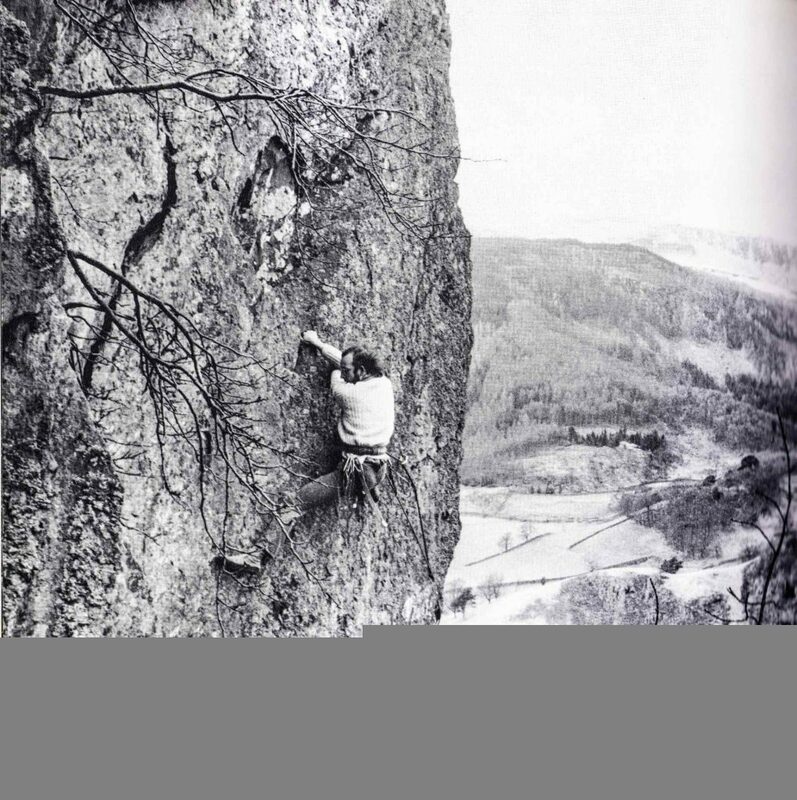 Yet here were monochrome (and some colour in later editions) pictures not only of the good climbs but also of the good climbers, some known by name only from poring over the history sections of climbing guidebooks. Lovely boy Crew, arrow climber. Wall without end. well-regarded Mountain magazine which again combined great pictures with interesting writing about cutting edge ascents from all over the world. There was no other magazine like it anywhere. He used the skills derived from the magazine to construct Hard Rock and a couple of sequels. 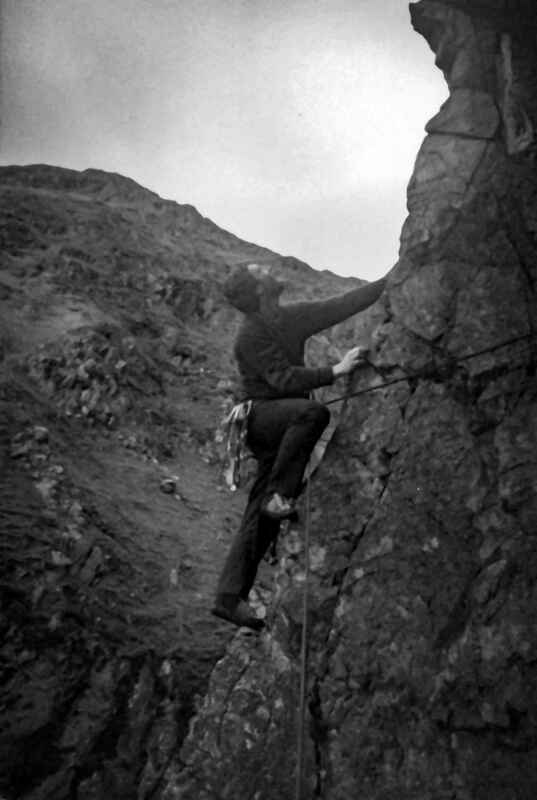 But Hard Rock was the one – many climbs to aspire to, but not so hard that the ambition seemed as out of reach as some of Grindley’s footholds. Meanwhile, I had started rock climbing. It took a while but in a couple of years I had reached a point where I was climbing some climbs of similar difficulty to the easiest routes in Hard Rock. It was getting time to test the ambition. So, one day in early summer, I found myself tying onto my ropes at the bottom of North Crag Eliminate. The first few sections, or pitches we called them, flew by. Even the infamous yew tree up which you scrambled to a rather battered nose cone. You started the tree swaying and at the critical point you stood up and, using momentum from the sway, you grabbed some big holds and swarmed up to an exposed ledge. The next bit was THE pitch. I stepped up onto a narrow ramp and teetered along it to the end. The cliff disappeared around a corner. THAT corner from the photo. I reached over for a large hold then stepped onto the prow, then peered round the arete. I have rarely been so disappointed. There was a line of enormous holds leading leftwards across the wall. Beneath were one or two small but decidedly welcoming footholds. Instead of rushing like Ed Grindley was supposed to be doing, I stepped delicately across, completely in balance and found myself in a comfortable niche. No reaching for distant footholds, no crossing my arms. I even had time to look around and enjoy the exposure. (Yes, I know, but climbers are peculiar like that.) The climb to the top was a bit puzzling but I was soon up, pulling the ropes through for Pete to follow me. Now I’m not now and never was a highly skilled rock climber, but that climb taught me a lot about climbing and, of more relevance to this website, about photography. Climbing first: don’t be misled by what anyone says about any climb. Make your own decisions. Trust your own perceptions. What a life lesson for a young climber! With the right picture you can motivate people to do quite extraordinary things. Depict the essence of something to aspire to and folk will take it on board. Challenge them to stretch beyond what they think they can do and they’ll surprise themselves. However, if you overstate the challenge, you WILL lose credibility when someone steps up and succeeds. If you are supposed to be portraying something in a journalistic way, exaggeration is not a great way to retain your influence, no matter how engaging the image is. You have to be mindful of the expectations of your viewer. No matter the failings of the journalism, this picture, now as then, illustrates perfectly my ideal climb. Not too hard, nor too easy. Steep. Masses of exposure. Big holds. Relatively safe. Most of all, unlikely: can you really climb there at such an amenable grade? Must feel amazing. Have to go and find out. The question remains, was it the photographer or was it the editor that let me down? I suspect Ken Wilson probably let his journalistic tendencies to tell a good story get in the way on this one. I bet he hadn’t done the climb himself (although I have no proof of that) and on seeing the picture, he thought a bit of licence with the caption was in order. The author playing up to the camera as a hardened cragrat. And why not? He had already got Grindley to wear a pale coloured sweater so he would stand out against the grey rock. The picture was a bit of a setup from the start, but the position almost demands something more dynamic. The handholds give it away – he’s hanging on to something pretty large with his left hand, and his right foot is on something substantial too. Why is he scratching around for something for his left foot all the way over there? Why doesn’t he just stand up? You have to go there to understand the quibbling – you can’t tell just from the photograph. What Wilson and Roper didn’t know was that a teenager in Birmingham would see the picture, take it to heart and carry an image around in his head for 10 years before discovering a slightly different reality. What does that say about the power of photography? I heard this evening (27th Nov 2018) that an enormous chunk of Castle Rock has fallen off taking North Crag Eliminate and a handful of other climbs with it. You can see the crack line at the top left of the picture in this article. I don’t think it was the fault of the photographer! UPDATE: Drone footage just published shows pretty much all the rock in the picture in this article has just disappeared. This is the second Hard Rock route to come to grief since publication. Classic Rock / Extreme Rock – the easier and harder versions of Hard Rock but to my eyes the colour photography reduces the potential for letting the imagination run loose. 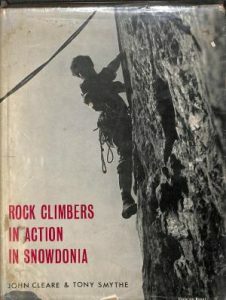 Rock Climbers in Action in Snowdonia – documenting the period in the 60’s when the hardest climbs in Hard Rock were at the cutting edge. 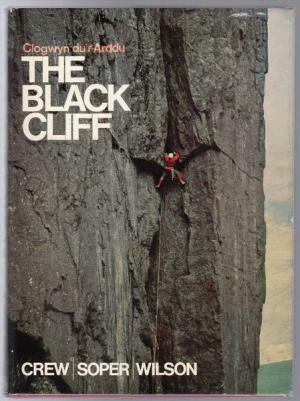 Seminal climbing photography by John Cleare.